I know that you have no idea how that poor security guy ended up like that. Probably raccoons. You know how aggressive they are. Actually… that could be a good comic too: The Raccoopalypse. That doesn’t roll of the tongue quite as well. Pretty gruesome I know. Hopefully you assumed this comic was about bears killing the hell out of people and were ready for such graphic imagery. Not that I am saying a bear did this. I would never spoil it like that. Who KNOWS who did that. …I was homeschooled and finished highschool about a year ago. I’m not really interested in going to college, because I don’t see the need to go and get a ton of debt. Making comics and telling stories has always been something I’ve enjoyed doing, and I actually have a small comic that I’ve been posting up on DeviantArt for the past few years. Lucky for me, my sister also enjoys making comics. We have lots of ideas for comics, and were thinking of making a website for us to put all of our comics on. The only thing is, we’ve never done anything like this, and we’re not sure how to start. How much does it cost? What sort of things should we be watching out for? What did you think was the hardest part about getting started? What is your favorite part about making comics? How about your least favorite part? Sally, it is true that I did not go to college, so it is true that it is not required for success in comics… but I do not recommend that route. I always did graphic design work and made sure I was learning skills and things that were more practical before Axe Cop happened and at age 29 comics finally became my job. They may not always be, but for now they are, and it is not an amazing income… in fact it is about the same income right now as my low end graphic-design job was in the past. My advice is that you shouldn’t just bank everything on your comics. The best way to start is just to make the comics, post them on a website and share the link any way you can. If you have something good and it is properly presented (easy to share), it will get attention. You can also sell books of course, but don’t wait for a publisher to pick you up. Just do limited print runs and see how they do at conventions. The only way to get good at comics is to finish them and do more. You can’t get good THEN do comics. One reason I am disguising Sally’s name and not sharing the link to her work is because I checked it out, and it is literally drawn in MS paint, it is two little balls with eyes talking to each other. Sally, I want to tell you, and I hope you respect my honesty, but unless you are one hell of a writer, I would not ditch college and invest your whole future in an MS paint comic. Can an MS Paint comic take off? Sure, this is the internet. Continue to make it, and continue to love making it, but don’t put all your eggs in that basket. I didn’t with Axe Cop, and I don’t think anyone who ever had notable success with an MS Paint comic did either. You do this kind of thing for fun, on the side, and if it picks up you were one of the lucky ones. That was Axe Cop for me. I did not bank anything on it succeeding… I didn’t put any eggs in that basket. I assumed it would go up on the web barely noticed. I was doing boring animated math problems in flash for my friend’s company for money at the time. One thing about success is you don’t get to choose if or when it will happen. You don’t get to choose what project it happens with. Other people choose it. When the internet went wild for Axe Cop, they chose for me my success, my path and my future. I did not set out to be the Axe Cop guy. So if you love making your comics, please continue, but if you really want to find out what people think of them, you need to show them to people who have nothing to lose when they tell you the truth. Your friends and family have something to lose if they give you an honest critique if your work is bad. They have to live with sad Sally moping around. When I was around 23 I went to San Diego Comic Con for the first time and I brought a Portfolio. I had come from a small town where being one of the best artists around was easy. Everyone is friends and family in a small town. When I got to SDCC I found out I was far from a great artist, or comic creator. I showed my art to people who could care less if I hated them after they critiqued me. Those people are priceless… because it is truly rewarding the day they genuinely compliment your work. Doug TenNapel didn’t say much of anything good about my art for years. He even told me at one point my work looked like bad Leifeld. OUCH. I hated it. But his first compliment on my work meant the world to me because I knew it was literally void of BS. It was the most meaningful positive criticism I had ever received. One thing I really hate about artists (and I am not accusing Sally of this, this is a general statement) is they tend to think the world owes them something because they express themselves. I am talking to all artists now… no one owes you a thing. No chef gets customers if people don’t like the taste of his food, no matter how much heart and soul he put into it. You have to have enough passion to do what you love regardless of if it will ever be your job. For me… there was a day in my early twenties that I realized that I really do have this thing in me. A drive to draw, to tell stories, to create. I decided that success couldn’t be a factor. I just did this stuff because it’s who I am, and I hope that whether I make a million bucks or no money at all I continue to do it because I simply can’t imagine being anyone else. And like that chef, he may love sardines dipped in cherry sauce, and make a killer Sardine/cherry sauce platter. But if he wants to be a chef and get paid, he needs to make something people love to eat. If you want comics to be your job, you have to make comics people want to read. So fine, express yourself, but if you want to make money you have to open up to doing work that people will buy. Some people think this is selling out. I think a true artist can work within any boundaries and I love the challenge of working within set boundaries on any project. That was probably a lot more answer, to a lot more questions than you asked, Sally. Thanks for writing and I hope you aren’t too discouraged. I posted this not just for you, but because I know there are a lot of young creators who need to hear this. If you want to ask a question, send it to info at Bearmageddon dot com and put “Comics Q&A” in the subject line. See you all on Friday! Reading this comic page by page has some really sweet payoff once in a while. It starts slow but I know we’re going to be seeing more of this kind of thing real soon. Glad you are enjoying it. 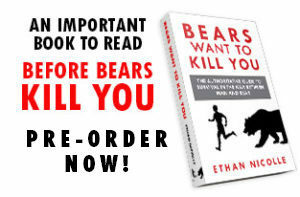 I knew that during the stretch of the first 30 pages of set up where there is very little bear attacks at two pages a week people would start to get restless, but you guys have been amazingly supportive. Although the latest comics *do* make use of animations, it started out with simple MS Paint comics. Now it’s selling merchandise. ms paint adventures are well drawn, and andrew hussie (the guy that makes it) is actually good at drawing, even before he made jailbreak. that’s why he can make the comic so damn fast (most of the time, not right now though). also ms paint adventures is incredibly plot driven. as he said, writing is also important. also by started out in ms paint you mean one page was in ms paint right. Yeah I knew about it, that’s why i admitted it can happen on the net. You just shouldn’t skip out on college and bank on it happening. but MS Paint Adventures is drawn in Photoshop you know. For years I’ve put off doing my own comic because I’m not “good enough.” Every few months, I’ll get serious and re-draw the first 6 or 7 pages, then lose faith in my ability and put the pencil down and not get back into drawing for months. It’s been almost a year since I’ve drawn anything at all and today’s blog post really inspired me. It’s time to pick up the pencil again and get some comics drawn! Thanks for the push in the right direction. Glad it helped, it’s some of the best advice I ever got. I still don’t think anything I do is my best work. Every project is a step up but I’m still catching on. Is the security guard going to get a character bio? Beautifully said. Absolutely pitch-perfect words of encouragement and advice. You touch on the nebulous idea of “success,” and I think it really is relative. It is easy for an artist to fall into a funk over that strange sense of entitlement you mention, but no “success” lasts forever and you should always be redefining what “success” means to you and your work (as you mentioned). While I surely wanted to be a breakout success, I’ve gotten to the point where I realized how awesome it is just to be posting comics to the internet that a handful of people really like to read. To me and my low self-esteem, that is success enough and that interaction, albeit limited by some people’s standards, pushes me to be better because I suddenly felt like I was a part of a community, something the internet so dearly lacks most of the time. I think, for internet-based creators, it’s a problem of context. Most creative endeavors are solitary ventures – webcomics, especially. A creator can become insulated and, to be honest, lonely because their work is done in a faceless medium. For many, it’s hard to see beyond the walls of their office where we scribble away furiously and aim for our self-imposed deadlines. Simply becoming aware of how many other people are working as hard as you can really level you out and even help you get better at your craft. Anyway, your response to Sally and artists at large was eloquent and salient. I think it is also hard on web comic creators because you just never know what will get a big following on the web, and often, for me anyway, I can not figure out how the heck it caught on. There are some amazing artists posting beautiful work and they are only getting a handful of views. GREAT page, Ethan. You got some keen cinematic instincts, bruv. For starters, I think everything you’ve said are words well written and should be carefully considered by anyone contemplating a creative field — particularly one that is self-driven. However, I have no idea who ‘Sally’ is or what her work looks like, but if I were her I would take your dismissive nature of anything done in MS Paint very discouragingly and might not read much beyond that unfortunately. Several web comics/stories I’ve followed for awhile now use what many might consider more rudimentary drawing styles, but they have still managed a dedicated fan base. Granted, those aren’t all MS Paint drawings, nor are they devoid of any drawing talent, some of them rely more on writing, some of them rely on more than just a comic, and I don’t know what the background of each of those creators is. My only counterpoint here is that just because it’s an MS Paint drawing of two balls with eyes talking to one another does not necessarily mean it should be dismissed or abandoned. I tried to be clear that an MSpaint comic can become successful,it’s just not something you should ditch college and bank your whole future on. I encouraged her to keep making it and maybe something will happen, but don’t expect it to become a huge success because you shouldnt expect that with anything. You should make it, release it into the world and find out what the response is. And I am totally aware of the comics you mention here, but i bet the ones who are making a living did not plan on that being the fate of them when they started. In comics all I mean by success is making a living. If you can make 10k a year drawing comics, you are a success, because 90% of comic creators don’t do that. Sally prefaced her email with preferring to skip college and draw comics, so i assumed she was saying she wants to make a living drawing these comics, which requires success. But yes your examples are valid and you never know what will gain an audience. I agree with Josh Vassallo – that is the best statement in an overall excellent commentary on artistic endeavors. I expand the citation because I particularly liked the emphasis on “finishing.” For me this is the hardest thing to do – FINISH a project, then move on. Very true. Finishing has proven to be the most difficult task of all! 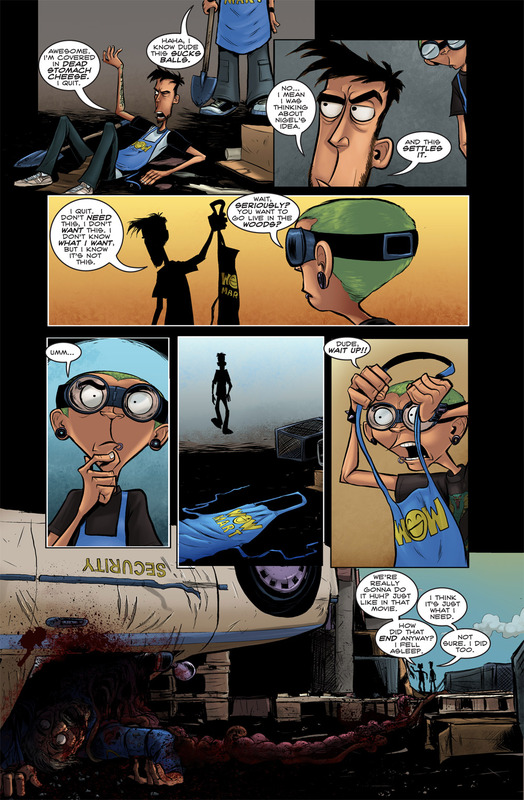 I find it quite comforting looking back through the Questionable Content (http://questionablecontent.net/) archives and seeing just how bad his first comics really are. They look awesome right now, you’d never have guessed what they would become just from looking at his old stuff. It’s nice to know that if I just start drawing something, anything, I’ll get better little by little as long as I keep learning and striving to be better. I totally agree. He really did tighten up, and his following is massive. Great comic, and great truths. It’s my commentary on my dumb generation. They think one step ahead, not two, or three , or four. The ending is not as important as the feeling they have right now. Your next work should be philosophy. When writing more than a gag-a-day webcomic, how do you go about planning the story arc. Flashbacks or no flashbacks, when to do exposition, ratio of action sequences to character development, when to foreshadow. That sort of thing. I wrote a script before i started drawing it. The script is rough and 98% complete, but i was dragging my feet on it, so i dove into drawing. I think at least having an outline befre you start drawing is important. If you are doing an ongoing comic with no end in sight, write the outlines in chapters. Write out what happens in each “season” then break each season down into outlines, then write a script for each season as it approaches. This is how i would do it, though i have never done an ongoing comic so who knows, there could be a better way. I agree with this advice! Not that I’m a professional or anything but that is how it goes in my experience. I have this junk piece of paper with a rough overall timeline of every major idea or plot point and some notes that I keep erasing, changing and adding stuff to. Then when it comes to each individual definite chunk or chapter or whatever, I do point form notes for each thing I want to happen, then break it down further from there. It’s a strip-thing not a page-thing though so it’s probably different! Your letter to Sally was well written and kind. I can’t help but think of the Proverbs 27:6, Faithful are the wounds of a friend; profuse are the kisses of an enemy. Thanks Ben, one of my favorite verses. My old mentor Pete used to read that to me at Breakfast on Saturdays. It’s funny, once you give up on anything but an astronomically rare possibility of anyone even reading your comic, let alone liking it and making it popular, the pressure disappears and you can start doing whatever you feel like, regardless of what people approve of.. and in the end, that produces some of the most creative stuff! that doesn’t make money, but it should. I don’t even draw my comic for myself anymore, I feel like I’m drawing it for the characters, like their story deserves to be drawn. I love how the security guard is already quite dead–and there just happens to be his car flipped on top of him. Talk about an overkill. In my mind the creature (or creatures) flipped his car, then started scratching and clawing into him as he was stuck upside down in his seat belt. It was pretty gruesome. BUT IT PROBABLY WASN’T BEARS RIGHT. Great page. I really liked how you explained to the readers what the tripping guts were without using the characters. And, as a side note, I knew I was going to regret knowing the former owner of that stuff. Ain’t that the truth, I try my hardest to not end up like that, but sadly I’ve run into people who think that exact way, like this associate of mine who claimed he didn’t need critique or advise because he “already knew how to make a good picture.” One thing I learned is that you never say you don’t need something when it comes to art, and you’re never too good for advise on how to get better. also the comic was epic. Humility is important in every situation. This is emphasized in religion and de-emphasized in the arts. This is why I am a religious man first and an artist second. I guess this is a ‘Take this job and shove it” moment. Poor security guard. can we all have a moment of silence for the security guard? Today’s episode was SWEET. Bears? Wild ferrets? Super Pig Lions? Find out in the next episode. And good advice btw. I thought it was well handled and kind. What’s the red syrupy stuff coming out of the security guard? Is he ok? BTW, if your old cartoons were like bad Leifeld, does that mean they had extra tiny feet? I think I was trying to draw muscley guys with lots of veins and little squinty eyes at the time. After I read every new page I go back to the first page and read everything all over again. I’ve almost memorized every page and every word of it. Keep up the good work! P.S. Those guts in the last panel are awesome. And I can’t wait to see them go “into the woods” and be attacked by some octobear, that will be awesome! I tried to make it obvious the car was behind a pile of stuff around the corner and no one had seen it yet. Oh. Hoo boy, Ken’s kind of a jerk but I wouldn’t wish that surprise on anybody. I would also read a comic of this guys hanging around, complaining about live and stuff, that would still be cool, but with bears, this is going to be awesome. I’m cuirous how the bearmageddon will break loose! I love this comic my friend. I can’t wait to see where the story goes. You know, Ken looks like an older version of Raz from Psychonauts. I love Paul and Storm! I really had fun doing that podcast with them and they got me a lot of fans with that. I haven’t read in a while because I’m an idiot and used to rely on Twitter for updates and stopped reading Twitter but here I am with MANY strips to catch up on which was awesome and I love both this comic and your blog posts. You speak truth, my friend. And you make good comics. Hey Bearmageddon fans, if you like Ethan’s awesome tips and frankness about the ups and downs of the art world, then check out Daarken. Not only is this guy’s conceptual art amazing, but his frankness about the industry and tutorials are priceless. A great help to anyone interested or just mildly amused by the concept realm of the art universe. I realize this is kinda hypocritical, but the instance of Joel getting dead stomach cheese on him made me feel much more ill than the last panel. Not sure why. Bearmageddon, hints of a Gorilla sequel (Ape-ocalypse? ), and now the idea of Rac’narok? And we aren’t even to explicitly bear-induced deaths. You, sir, may be on to something here.